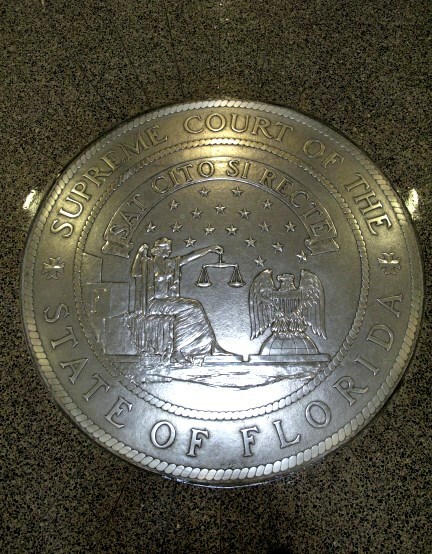 "Soon Enough If Done Rightly"
The origins of the official seal of the Supreme Court of Florida go far back into an obscure history. Before statehood in 1845, Florida was a territory of the United States governed by federal law. 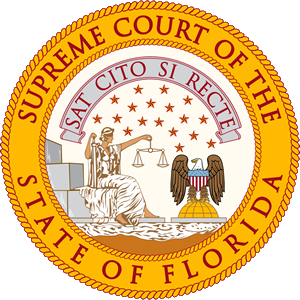 In 1824, Congress created a Court of Appeals of the Territory of Florida, which is the immediate predecessor of the present Supreme Court. Sometime between 1825 and 1845, the Territorial Court adopted an official seal that later formed the basis for the seal reproduced above. Unfortunately, the original metal disks from the first seal have not survived. In the early 1980s, Supreme Court Librarian Brian Polley attempted to locate original sealed documents issued by the Territorial Court. Several were found in the Florida State Archives, but nearly all had been compressed through years of improper storage, causing the loss of fine details. Mr. Polley did learn that the Territorial Court seal was strikingly similar to the present Supreme Court seal, with two notable exceptions. First, a seated Goddess of Justice appears in both seals, but in the Territorial version the eagle faces away from her. Second, the Goddess in the Territorial seal is seated on a bale of cotton, whereas in the present seal she is seated on a block of stone. The use of a cotton bale undoubtedly reflects the importance of cotton to Florida's early economy. The present seal was officially adopted in 1950, and is the one set into the floor immediately beneath the Court rotunda. As in all prior seals, the official motto is the Latin phrase Sat Cito Si Recte (pronounced as saht see-to see rayk- tay), which means "Soon enough if done rightly." The phrase indicates the importance of taking the time necessary to reach the correct result. In the seal the Goddess of Justice is the Greek goddess Themis. She is blindfolded to symbolize the impartiality of the law, and she carries the scales of justice in one hand and the avenging sword in the other. The letter "F" carved into the stone behind the Goddess symbolizes Florida. The eagle has been interpreted as the power of justice ruling the world. There has been much debate over the significance of the eighteen stars above the Goddess. Some have speculated that they mean nothing. One possible explanation, however, is that they symbolize Themis' daughter, the virgin goddess Astraea, whose constellation in the night sky is known as Virgo. To the Greeks, Astraea symbolized innocent justice, which was thought to have prevailed on the earth during the Golden Age. When sin entered the world, the Greeks believed, Astraea was removed from the earth and placed in the heavens as the constellation Virgo -- the virgin -- an eternal reminder of the innocent justice humankind had lost.